Congratulations are in order for Deputy Jan VanNiekerk. He has been selected as the "Elks Lodge Deputy of the Year." This award was presented at the Elks Lodge in Harrisonville, Missouri on the Twenty-First day of April, in the year Two-Thousand Sixteen. Deputy Jan VanNiekerk was nominated by his peers to receive this award. 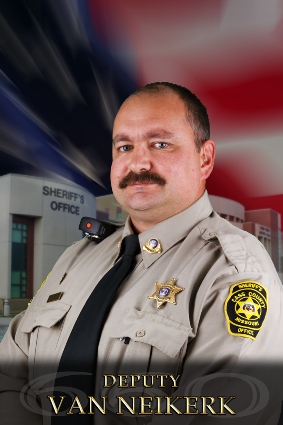 Among other acts, in February of this year, Deputy VanNiekerk pulled a suspect from a burning vehicle. The suspect was attempting to allude several other law enforcement agencies when he struck a pickup truck. Neither party was seriously injured. Dash camera video is available by clicking on the player below.